So, my Q700 that was only in my hands for about a month is suddenly having hardware/ADB issues as well as the 950 I've written about here. Background is above. Pardon the crosspost but I wouldn't normally hang out in the Peripherals section so maybe others wouldn't either... and this graduated from a problem isolated to the video card to impacting the entire machine! Here it is in its glory/gore. Thank you in advance for following along! Above PC 24x jacked up my Q700. Machine at the time had a upgraded/soldered 33 MHz crystal, PPC 601 PDS card, PowerPump NuBus card and companion SIMM that was supposed to increase the clock from 33 to around 40 MHz but I never could get it to work. The Quadra came to me without an 040 CPU so I bought a MC68040RC40A (note the 40 MHz so it should handle the overclock just fine) and installed it, even though the 601 runs most of the time. I have a 3-port ADB/HD15 KVM switch that works (seemingly) perfectly. Plugged in the Radius card to revisit the issue I noted in the above post and it basically the mouse went out shortly thereafter (after a couple of reboots, there wasn't a particular moment of failure). Clicks work but no x,y movement. The pointer is grounded in the upper-left corner, regardless of boot disk (SCSI2SD or original HD), OS version (7.6.1, 8.1, 8.5) or H/W configuration. Booted from Legacy Recovery CD (7.5 IIRC?) and FloppyEmu (various versions). I get an 0000000F/00000021 occasionally when I try to boot from SCSI2SD, usually if I don't pull the PRAM battery AND power for ~30 sec. I have a Snooper NuBus card that I'm not even sure is working. It lights +5V, +12V and -12v light up but no ADB or Activity - the orange clock LED blinks rapidly ... but it does the same thing in my working Iici too. The main symptom is STILL: the mouse clicks but doesn't move. (which is great if the Apple menu were a "FIX ME AND GET FILTHY RICH IN THE PROCESS" button). I'll buy a Q700 board if someone has a working one for sale but that's a last resort. But I also want to get this solved and put my front bedroom/lab back together soon. And thank you again for hanging in there with me! The "memory" (or delusion) is very old, but I think I had the same symptom (or completely unrelated mouse symptoms) on a similar age machine. At some point, Apple moved the ADB control into a dedicated CUDA chip. The part number on the thing is either 341S0788 (newer) or 341S0060 (older). It is a 28 pin SOIC (14 pins per side) chip made for Apple by Motorola. I'm just not certain that the CUDA appeared as early as the Q700. I know it was on the AV Quadras. And it wasn't on the 68030 Macs. So it first appeared with one of the three generations of Quadras (Q700/900; Q610/650/800; or AV Quadras). I would check the Q700 board for one of those, clean thoroughly around it, and if necessary, touch up the solder on its pins. Worst case, you might need to replace it with one scavenged from another board. Unfortunately, it's a custom Apple chip. It is said to be based off of a Motorola 68HC705, so in theory, we should be able to figure out how to reproduce one, but as far as I know, no one has. and look to the left of the second PCI slot from the bottom, you will see a CUDA chip. Yes, the CUDA chip had a long life from the Quadras to the PCI Power Macs. I'm just not certain that it appeared as early as the Q700. Trag - thanks for the thorough reply on this. I wasn't able to find a CUDA chip on the Q700 board (nor a reset for the CUDA like I'm used to seeing on my Power Macs & G3. For what it's worth, I was trying to figure out how to get the Newer Technology PowerPump working on this machine (came pre-installed) and I assumed it wasn't working because it lacked an 040 when I bought it. So I bought a 40 MHz 040 but it still didn't work, but maybe it had to do with the 66 MHz crystal the previous owner had used to replace the stock 50 MHz one. I don't know what this particular IC does and maybe it's a red herring but when both connectors are attached, no chime (never did). Right now, the board is bare, leaving the stock/soldered VRAM, 4 MB RAM, 040 CPU and ADB peripherals. Regarding the PowerPump I'm sure you've seen this video? Most definitely. The original owner never used it - I got the full box w/ manuals, etc. Everything you see in the video. Shame because, even though the 601 card is running at 66 MHz by way of the clock chip, could manage to get 80 out of it with the PP. Anyway, maybe it never worked because of the 66 MHz crystal (even though I set the ROM SIMM jumper for the 33 MHz Q950), but maybe, just maybe there is a bad part that went from flaky to failure, resulting in this "partial" ADB outage. Also, I noticed it often boots to a Happy Mac twice each time it's powered on. Wonder if this https://mac68k.info/wiki/display/mac68k/Diagnostic+Mode can be used on a Quadra? I wasn't able to find a CUDA chip on the Q700 board. Unfortunately, it's a custom Apple chip. It is said to be based off of a Motorola 68HC705, so in theory, we should be able to figure out how to reproduce one, but as far as I know, no one has. Everything correct. CUDA is a custom model of the 68HC705 MCU Motorola made for Apple. Its Motorola part number is 68HC05EG. Because Q700 doesn't have CUDA, it uses the "Bit-bang" ASIC instead, Apple part number either 342S0440 or 342-0440-A or 342S0440-B, see Mac Technical Notes. Thank you for the info, Powermax. Very cool. Am I reading you correctly that someone has already downloaded the CUDA firmware out of the CUDA? pb3623, apologies for the mini-hijacking of your thread. Powermax, Should we start a CUDA thread in hacking? So I got smart and checked the Hardware Developer Note for the Q700. It does not use a CUDA chip. It has a VIA1 and VIA2. I'm not sure what those look like on the logic board, but the goal should probably be to identify VIA1 and then clean/examine pins and traces between that and the ADB port. Edit: Looks like Powermax identified the part number. ACcording to the Developer Note, ADB is controller by a chain of VIA1 and then GI ADB transceiver. I'm not sure which of those is the chip referenced above. 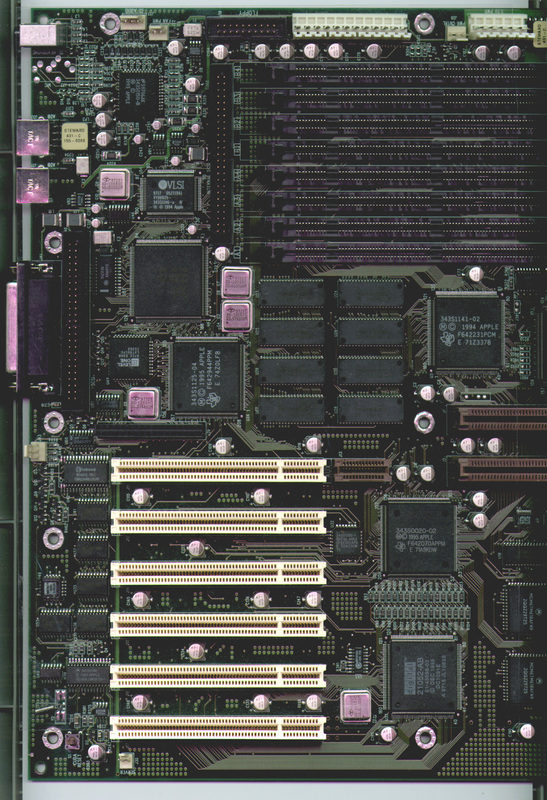 Again, a good scan/picture of your logic board that allows us to read the markings on most of the chips would help with that. We might be able to identify the VIA1. I have at least one Q700 at home, but it's not very accessible right now. I know I have some boards in a box in the sun room; I was removing caps and cleaning them, but doesn't the Q700 have tantalum caps from teh factory? So it wouldn't be in that batch It's been so long since I started that cleaning project, I can't remember if there's a Q700 in the mix. It's mainly a bunch of very gooey IIcx's and a couple of Q840AVs and a couple more boards that might be Q700 or Q800, I can't remember. Am I reading you correctly that someone has already downloaded the CUDA firmware out of the CUDA? Here’s a picture of the above-mentioned ASIC 342S0440-B. I poked around the chip - each pin’s solder joint appears to be intact. I did notice the fuse above it but assume that blowing would be obvious AND be all or none? I did notice the fuse above it but assume that blowing would be obvious AND be all or none? Those are resettable SMD125 fuses similar to this one. The theory on their operation is well explained in this Wikipedia article. Could you shoot a picture showing the whole ADB circuitry (the connector and the 342S0440-B ASIC)? is the failing mice attached directly to computer's ADB port? did you try to attach the Keyboard instead? Does it work then? tried with only one device at a time? Sure. The ADB ports are J3 and J4. The ASIC is U12 for reference. Yes - I usually use a 3-way ADB KVM but did away with it for this troubleshooting effort. Both devices work fine on other machines. Only mouse click is registered in each of the above scenarios. Hmm, if the Keyboard works as expected (different keys recognized) then it's safe to assume that the ADB circuitry is intact. I'd look for software-related issues. Does the mouse pointer respond to mouse movements during boot or is it frozen? Frozen and I’m booting from SCSI2SD, the original Barracuda and even a 7.1 floppy. And done so with and without the 601 PDS card when possible. What I haven’t done is to boot the Legacy Recovery CD. Last question: what happens with a keyboard attached? Does it respond when you press the TAB key/ any other key? CD is booting now. Same exact behavior. Not that I think this is relevant but this is all onboard video up to this point. Recall this stated with an apparently bad/haywire Radius 24xj. I can (limited) navigate with the arrow keys and shortcuts where possible. Power key works to bring both up and down. Combinations like Cmd-Opt-P-R also register. Well, damaged ADB circuitry is very unlikely then. This is good news indeed. Bad news: it looks like you're experiencing another hardware-related issue. Is it possible to boot up the machine with PRAM battery removed? Yes and I’ve just done so. No change. I once read something about TechTool’s PRAM zap to be more thorough than the usual method. The problem is there is no keyboard shortcut once you launch the app so I can’t actually do the zap. Which led led me to the aforementioned ADB renewal/resets that also had no effect. What I’m trying to do now is to get the the Easy Access and PRAM Auto-Restore control panels copied over so I can try and use Mouse Keys to control the cursor. I’ve also pulled all the VRAM and RAM, essentially running the 040 on a bare board. Even burned a stock Q700 ROM to a SIMM and booted with it, to no avail. At this point, I’m trying to get mouse movement before the flashing ? floppy (since I see no reason to involve SCSI at this point). Bumping this in case anyone else has ideas... I worked around the issue by acquiring another Q700 but I would like to get this one working... it does have a 66 MHz crystal so the 040 and 601 PDS card run ~30% faster than stock. Another theory - does anyone know what IC chip U54 does? It's located directly below the CPU oscillator. To install the aforementioned PowerPump card, you connect a hook to pin 1 of the oscillator, and a claw to pin 1 of U54. Both of these wires run to a ROM SIMM, which itself is connected to the actual PowerPump NuBus card. The system doesn't chime when the claw is connected to U54. If I take it off, it boots fine (but obviously the PowerPump doesn't work). Could U54 be bad, and, depending on its function, could it be causing my ADB issues at all? What is the part number on U54? I've seen clock buffers in the kind of package in the diagram, but lots of other chips come in that package too. You might also check the two diodes (D1 & D2) behind the ADB port. It can be hard to check them in-circuit, but it's worth a try. If one of them doesn't conduct in one direction, that could be a simple fix, although I agree with Powermax that it doesn't seem like the keyboard would work if you have a fundamental problem with the ADB circuitry.